Are you familiar with the World Backup Day? It started to be celebrated back in 2011, and it highlights the importance of protecting your data. Often, people back up their files because they don't want to risk losing their precious digital memories, for example. However, businesses may lose a lot more (think money and customers' trust) in case that their data is lost. Most computer users think that their data may be jeopardized because of a hard drive failure. It happens quite often, and several drive manufacturers have high annual failure rates. However, there are many other reasons why you should back up your data regularly. Think natural disasters, stolen devices, cyber attacks, ransomware infections, and so on. Therefore, you shouldn't ask yourself "if" a data loss will occur, but rather "when" it will take place. And when it happens, you'd better have a solid, fully set up backup system in place. Here are some tips that should be of help. Begin by researching the best storage options. For most business owners, tape-based storage was the preferred solution only a decade ago. In fact, tape backups are still used by many companies even today! That's definitely not a great idea, because tape-based storage systems are prone to errors. This means that you should focus your efforts on disk drives and cloud-based storage. 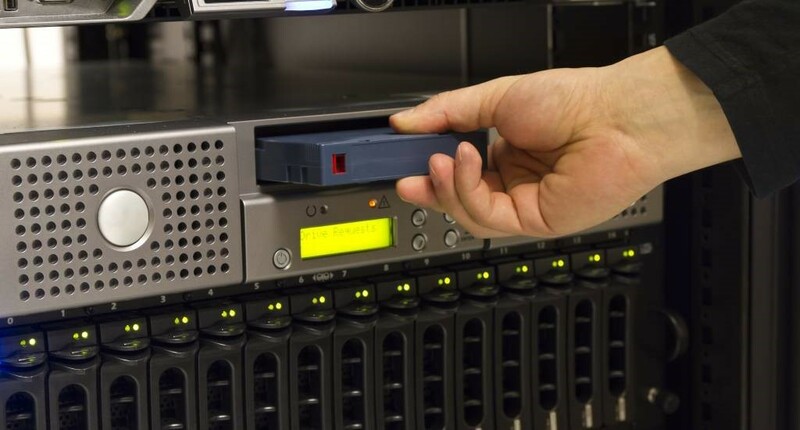 Fortunately, disk storage costs have significantly dropped within the last few years, and this has made them the ideal backup solution for small business owners. Today you can buy a few terabytes of disk storage for about $100, so it makes a lot of sense to purchase two drives, back up the key company data on both, and then store one of them off-site. Cloud storage costs have decreased as well, so they are a viable alternative. Providers such as Amazon or Microsoft offer plenty of additional services and top-notch tech support, making cloud-based storage a good backup option as well. No matter what option you choose, ensure that your data is fully secured. It has been demonstrated over and over that most security breaches are caused by unencrypted data sets. As mentioned above, besides hardware failures, your data may be destroyed or fall into the wrong hands due to stolen devices and ransomware, for example. So, research the best data encryption methods that are available, and then use them to secure your data. For most people, the Advanced Encryption Standard (AES) algorithm, which has been adopted by the US government as well, will do a great job, especially if you will use an application that utilizes a 256 bits encryption key. Reputable online-based backup services providers utilize 256-bit, AES-based end-to-end encryption as well. If you value your data, don't ever choose a solution which doesn't meet these standards. It is true that external hard drives have the advantage of allowing you to recover the data as soon as you need it. Therefore, if you prefer to use a cloud-based backup service, don't forget to pick a plan that has an acceptable Recovery Time Objectives (RTO) value; otherwise, you may have to wait for a day or two before being able to retrieve your data. Some company owners may be okay with that, but for others, the lack of data will severely affect business continuity. Always choose a solution that is easy to use and offers advanced reporting features. Pick an application that has a clean, easy to use interface, and is easy to configure for your specific needs. Also, don't forget about customer support. You want to work with a provider that offers tech support 24 x 7, is knowledgeable and friendly. Once that the backup system is in place, don't forget to test it thoroughly. Strive to perform monthly tests across several locations, and then see if you can recover your data while meeting your chosen RTOs. I will state this once again: don't forget to choose a reputable provider. It is much better to pay a little extra and choose a company that has a proven track record, rather than pick a newly founded provider which is only interested in making a quick buck off its unsuspecting customers.